When the results were coming in for the Birmingham city council elections I perceived that South Asian and female candidates were doing worse than average. So I thought I’d do a quick analysis of the data. I looked at cases where a party had two candidates in a ward, one of whom was female and one male, and also where a party had two candidates, one of whom was South Asian heritage and one was not. Therefore in female-male matchups, women did on average 3% worse than men. In these matchups, South Asian heritage candidates did on average 5% worse. I’ll leave it to the mathematicians to decide whether these differences are statistically significant. And even if they are, it’s really necessary to do a similar analysis of other years’ and other cities’ results. Of course there are several factors involved in explaining why two candidates from the same party gained different numbers of votes. One is recognition/experience. Another, believe it or not, is alphabetical order. But this initial analysis hasn’t dispelled my initial perception. The City of Birmingham (including Sutton Coldfield) has 10 constituencies: Erdington, Perry Barr, Ladywood, Hodge Hill, Yardley, Edgbaston, Hall Green, Selly Oak, Northfield and Sutton Coldfield. Under pressure from politicians, the Commission has decided that, rather than respect our cities and communities, it will, for its own convenience, and the convenience of the politicians, split our cities apart. This is not just happening in Birmingham – several other cities are affected, including Liverpool, Nottingham and Southampton. If we split two Birmingham wards, probably Oscott and Bartley Green, we can keep the city together and keep the changes to our constituencies as small as possible. It’s not rocket science. For the third year, I’ve been out on the streets of Soho, canvassing for the city council’s Elections Office in order to get as many people onto the electoral register as possible. The process has been made a lot quicker, easier and cheaper this year by the use of data matching, by which I guess they mean they match non-responding households up with council-tax records. So all that’s left for me and my fellow canvassers is to check on the 14% of non-responding households that they don’t have any data for. In my case the percentage is a bit higher – instead of 250 houses to visit, this year I have to go to 100. 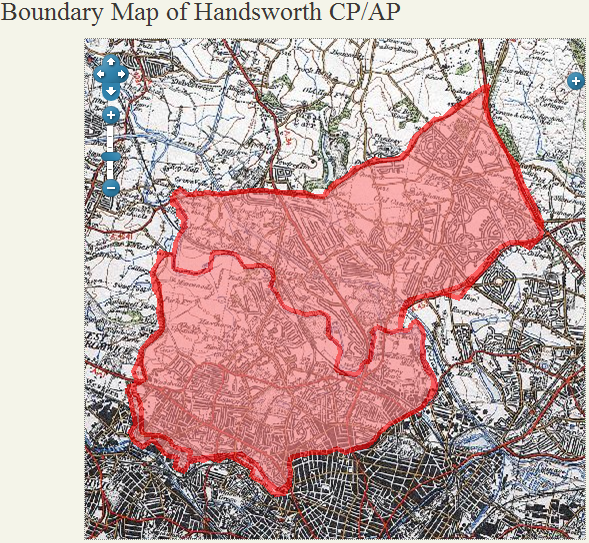 The Boundary Commission propose to tack the ward on to a new Smethwick seat (pdf) but only the Cape Hill quarter has any connections with Smethwick. 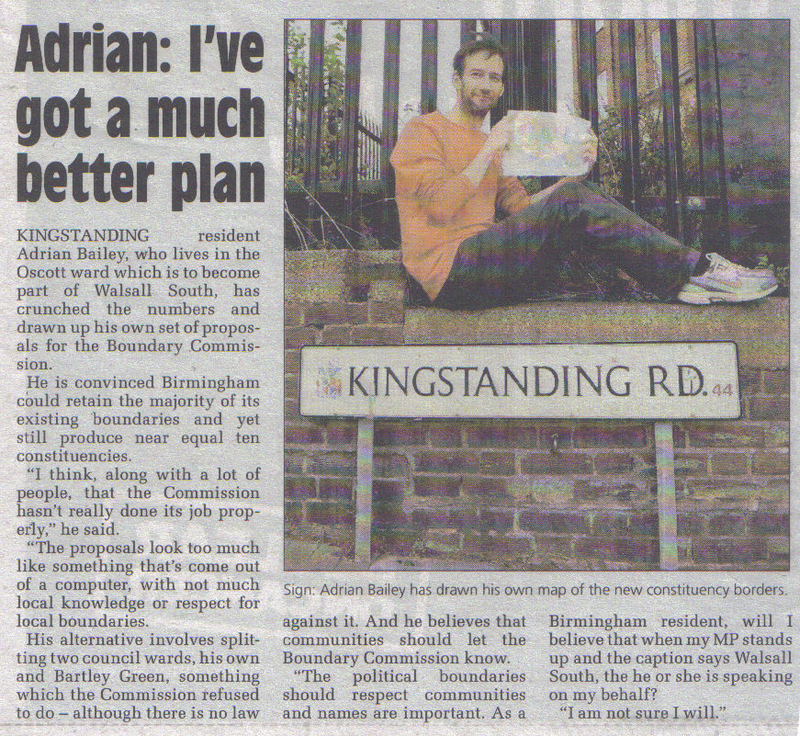 In the current boundary review, I’ve proposed that the ward should be part of a Perry Barr or Handsworth seat, with my street in Oscott at the other end of the constituency, and that seems a good plan to me. The parish and town of Handsworth stretched all the way from the Hockley Brook to Sutton Park and it’s a shame that there hasn’t been a Handsworth constituency since 1983 – currently the area is divided between the Ladywood and Perry Barr seats. By the way, 9th November is the 100th anniversary of the town of Handsworth leaving Staffordshire and becoming part of the city of Birmingham in the county of Warwickshire. Is Halton the whipping boy? The relationship of Cheshire to Halton (a council formed from the towns of Widnes and Runcorn) is a case in point. In order to satisfy the requirement for electoral equality – and god forbid that anyone might split a ward instead – the Commission and the political parties have all come up with plans that butcher/drain the district. Halton has an electorate of 92,550 so at least 12,000 voters do have to find a home in another constituency, and currently some Runcorn wards are in the Weaver Vale seat. That seat’s being abolished, so another home needs to be found. In my plan Cheshire is “full up” so I’ve put some Widnes wards in the St Helen’s South seat. Whether you like that or not, at least I’ve maintained the principle of only dividing Halton between two seats. 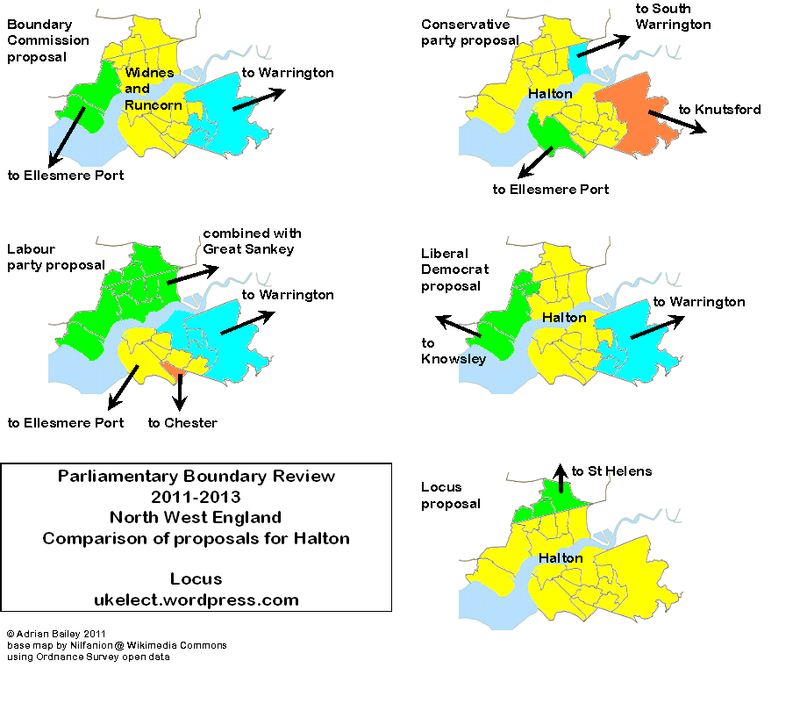 Dividing Halton between three seats, as under the Boundary Commission or Lib Dem plans, or four (!) seats, as under the Tory and Labour plans, is unfortunate to say the least, and is not a product of any deep thought about the ties that particular wards have with neighbouring areas*, but simply about making the numbers up in other seats. 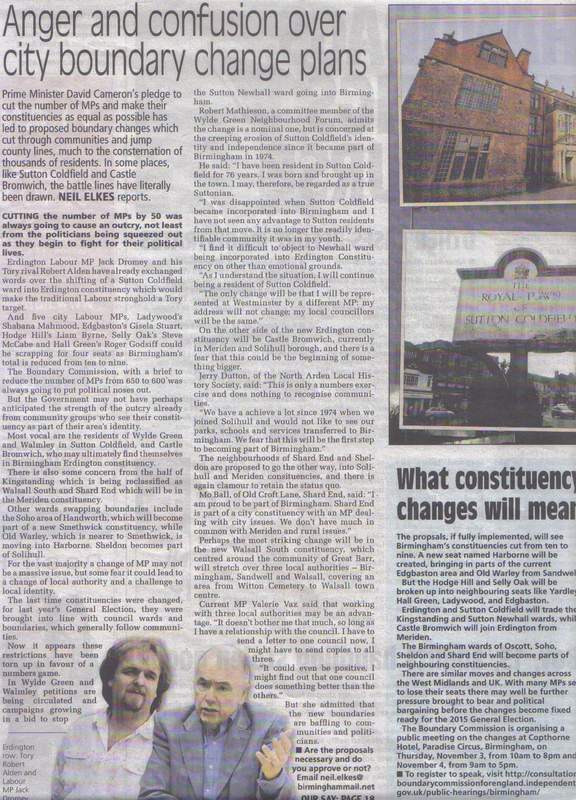 *Notice that some of the areas that the main proposals link Halton with are hardly “neighbouring” at all, such is the desperation that is caused by the mania not to split any Cheshire wards. The Commission links Ditton with Bromborough (20 miles), Labour link Beechwood with Chester (15 miles), and the Tories link the eastern edge of Runcorn with Alderley Edge (20 miles). And the same thing is happening around the country, where, for example, instead of reviewing Liverpool, Birmingham, Sheffield and Leeds on their own, with a couple of split wards in each, the Commission is leeching their smaller neighbours. 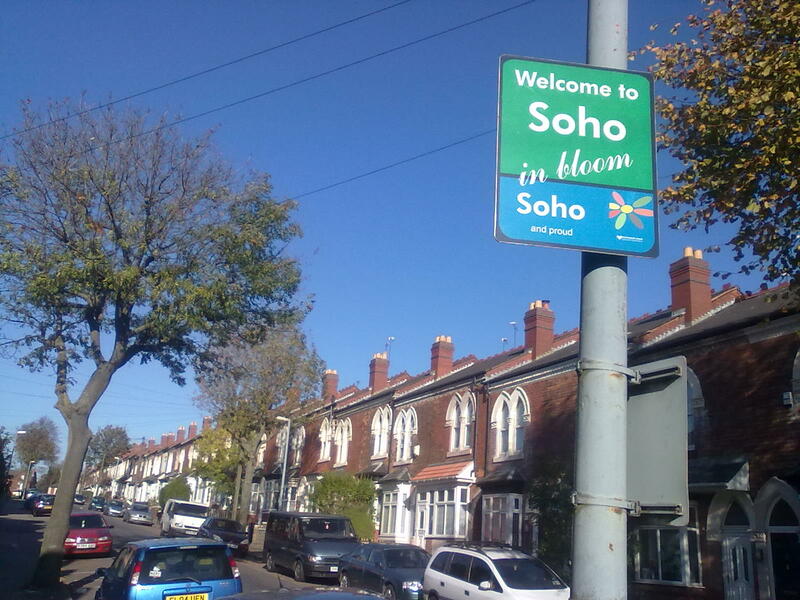 If splitting wards causes a bit of suffering to the communities in these cities or in Cheshire, isn’t that at least fairer than causing suffering to the communities in their neighbouring areas, whose only crime is to live nextdoor, and where towns are being divided just in order to make life a bit easier for the Commission and its political allies? If you’d like to make a comment to the Commission about its policy with regard to tacking, you can email them. “My plan” for Birmingham is actually Phil Davies’s plan. My original plan was similar but Phil’s (see below – map from the Vote UK forum) is very likely to succeed because it’s the minimum-change option.